Juniper Networks family of NetScreen and SSG Firewalls are second only to Cisco in worldwide unit sales. These devices are becoming increasingly sophisticated as threats to networks continue to grow exponentially. This is the essential reference for any IT professional responsible for configuring and managing the devices. • Deep Inspection firewall extends stateful inspection to detect application level attacks and stop them at the network perimeter. • Integrated Intrusion Prevention for unmatched application-level protection against worms, Trojans, Spyware and malware in the enterprise, carrier and data center environments. • Centralized, policy-based management minimizes the chance of overlooking security holes by simplifying roll-out and network-wide updates. • Virtualization technologies make it easy for administrators to divide the network into secure segments for additional protection. • Rapid Deployment features help minimize repetitive tasks and administrative burden associated with wide spread deployments. Rob Cameron (JNCIS-FWV, JNCIA-M, CCSP, CCSE+) is a Security Solutions Engineer for Juniper Networks. He currently works to design security solutions for Juniper Networks that are considered best practice designs. Rob specializes in network security architecture, firewall deployment, risk management, and high-availability designs. His background includes five years of security consulting for more than 300 customers. 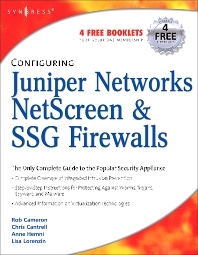 This is Rob’s second book; the previous one being Configuring NetScreen Firewalls (ISBN: 1-932266-39-9) published by Syngress Publishing in 2004.